Synopsis: There is the world we know: the Seen. All around that, lies the Unseen. The Shaman stands between these two worlds that weave together in an intricate dance. The Unseen worlds are vast, and filled with things beyond our comprehension. But the Unseen affects us, either way. Wayra is one of the last of the Andean Shaman. She grew up learning all the secret mysteries of life and the universe. In school, she studies the Environment. Outside of school, Mountains, rivers, and clouds speak to her. 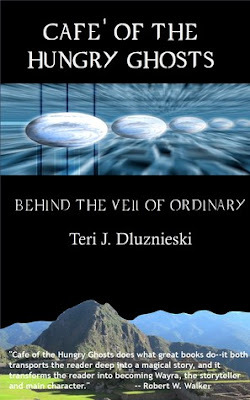 She journeys between the realms of the living, and the dead: tuned into those countless energies that affect our world. In the ordinary world, she struggles to find her place- both as a young adult, and as a healer. A healer in a society that no longer understands the power and importance of cosmic forces. At 19, Wayra is coming into her power- finding confidence as she navigates these worlds. Suddenly, there is something new in the Unseen: stalking Wayra. It begins with trivial things, but quickly becomes bigger things. Chaotic terrifying dreams in unknown landscapes become omens of danger to come. Her animal totems disappear from her life, her friends are in danger. The darkness in the Unseen begins consuming her life. Wayra must figure out what the force drawing toward her is, because it might be more than her own personal world at stake. Review: This is an excellent book and it kept my attention from start to finish. I just could not bring myself to stop reading and finished the book very quickly. If there was a printed copy of the book then I would be sure to buy it so I could enjoy it over and over again. I would recommend this book to anyone who loves to read stories about the occult. This is also a good book for anyone who is an avid reader.